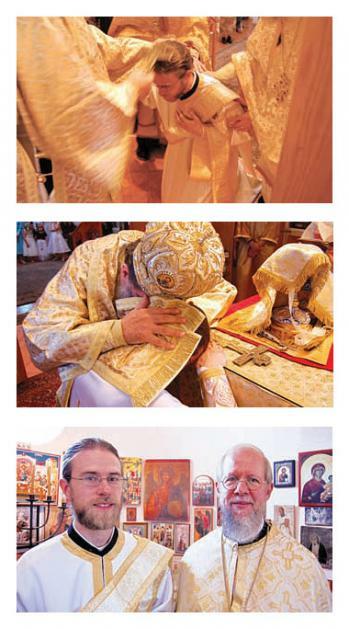 During the weekend of June 7–8, 2008, clergy, family and friends gathered at Holy Trinity Orthodox Church in Santa Fe, New Mexico, to witness the ordination of Fr. Daniel Bethancourt by Bishop BASIL – first to the diaconate and then to the holy priesthood. Fr. Daniel’s sponsors to the diaconate were Holy Trinity’s Archdeacon Basil Rives and Dn. Justin Havens of Ss. Peter and Paul Church in Salt Lake City. His sponsors to the priesthood were his father, Archpriest John Bethancourt, and his spiri­tual father, Archpriest Paul Moses Jaroslaw. A number of other area priests served along­side Bishop BASIL at the two hierarchical divine liturgies, including Hieromonk John Anderson of St. Michael’s Skete in Canones, Economos Demetrios Demopulos of St. Elias Church in El Dorado, Fr. John Hennies of St. Dimitri Church in Los Alamos and Fr. Luke Huggins of St. Juliana Church in Santa Fe. Holy Trinity’s Subdeacon Raphael Nava and Subdeacon Joseph Olas, a classmate of Fr. Daniel from St. Vladimir’s Seminary, also served. His Grace also offered profound words for all those present. He spoke of the ordination as an of­fering of “living prosphora” – a sacrifice made pri­marily by Fr. Daniel himself, but also by his wife Kh. Maria and their soon-to-be-born child, his parents Fr. John and Kh. Photina, and all those who love him. This dramatic image emphasized the holiness and gravity of the offering while connecting the whole community to the sacrament. Fr. Daniel graduated from St. Vladimir’s in 2007; he and Kh. Maria were married soon after. Now with their infant son Peter Basil, born on the Feast of the Dormition, Fr. Daniel and Kh. Maria are settling into their new life at St. Nicholas Orthodox Church in Shreveport, Louisiana.